Well now, do we have some super fun things to talk about!!!!! First things first, I just have to share/talk about this awesome experience and customer we recently worked with. A few weeks ago we received an order on Sweet Lavender Bake Shoppe's Etsy site for 2 edible Hello Kitty inspired heads and 30 edible Hello Kitty inspired bows- both made out of gum paste and all bows a super cute bright pink color! HOW FUN!!! We seriously couldn't wait to get going with that. We just love making edible decorations so much. Not only does it really allow us to be creative and artsy, but with the help of my amazing artist-husband, Bill Main, we get the job done right. He has a degree in Illustration from the Art Center College of Design, so he definitely knows what he's doing! 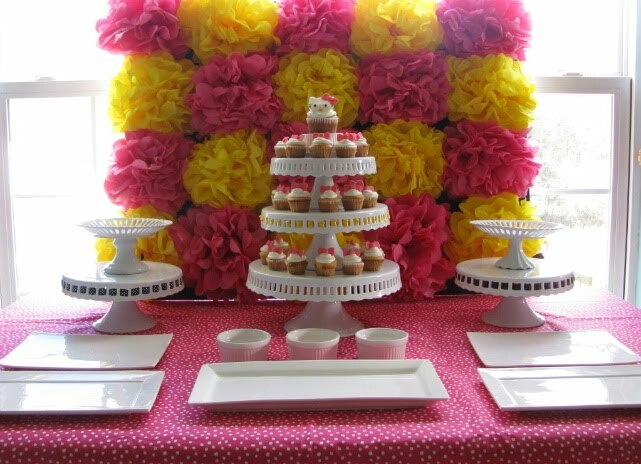 Every edible decoration we make uses a stencil that he has made by hand and has created himself. Lucky duck I am, huh?? 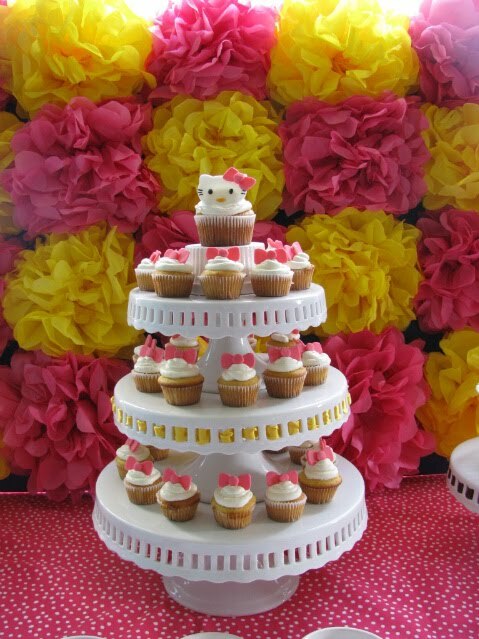 Our Hello Kitty inspired edible decorations are no exception. 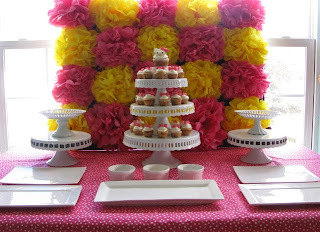 Anyway, it turns out the order we received was for a woman who has her very own awesome (and I must say very neat) blog where she shows ideas and creative ways to decorate and host your own parties- Sheek Shindigs. It's a great place to find inspiration, products, and decorating ideas. She recently hosted a birthday party for her very own daughter, who was turning 2, and threw her a very sweet Hello Kitty themed party. That's where we come in- she stumbled upon us and loved our products. 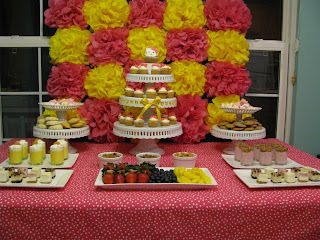 To visit her site and browse around, click here- or to view the specific blog she wrote about the Hello Kitty party, featuring our little cuties (and how she beautifully presented them) click here. She was such an awesome client! Here's the super great news- she's featuring us on her blog! How neat is that!? This would be a first for Sweet Lavender Bake Shoppe! Sure, we have a few blog friends that have us listed under some of their favorite blogs, but with Sheek Shindigs- you will find us not only listed under "Vendor Information" on the blog written about her beautiful party, but she's also adding us to her Vendor List! Woooohoooooo!!! We are so honored and feel very blessed. Which brings me to my next thing: We have now added a "Featured On..." column to our blog. You can now view specific sites or blogs we have been (or will be, hopefully!) featured on. It's located on our homepage- bottom right! So make sure to check that from time to time and see what we've been up to! And finally!! We were also loved on, written about, and featured on the VERY talented Sunshowers and Rainshine blog today!!!!! This girl, Mrs. Lynn Lindsay (hehe, I have to admit I love her new married name) is just plain wonderful. She and I have known each other for some time now (ohh....6 yrs? 7?) and just completely fell into a deep friendship based on nothing better than our love for Christ....and Anthropologie. :) She is so amazingly talented and has recently started her own artsy business as a professional photostylist and handmade goodie-maker. Thank you Lynn for your continued love and support. Please click here to see her blog about us and here to see her new beautiful website. It was great working with you. Your toppers were perfect and I look forward to working with you again in the future! Thank you for all of your kind words about Sheek Shindigs! Love Hello Kitty! Great job.